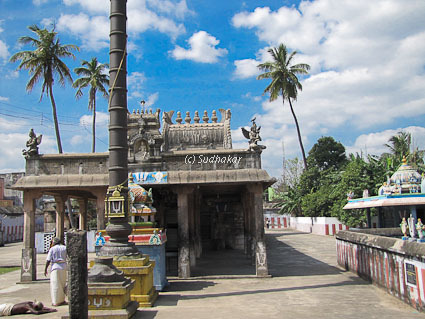 Pandava Thoothar Perumal temple is one of the 108 divya desam temples situated in Kanchipuram. As per the legend when Pandavas lost all their wealth in a gambling game to Duriyodhana and company of Gauravas , they were shelterless. Sri Krishna went to Duriyodhana as a goodwill messenger ( Thoothan in Tamil )to ask for atleast five houses for each of them. The cunning Duriyodhana wanted to kill Sri Krishna and he created a false bamboo chair for him and placed a few soldiers beneath the chair. Lord Sri Krishna knew this all along and sat on the chair. He then took 'viswaroopam' killing all the soldiers hiding beneath the chair. Since Sri Krishna went as a messenger ( Thoothar) to the Pandavas, he became known as Pandava Thootha perumal. Moolavar is Sri Pandava Thhothar. Moolavar is found in sitting position facing East direction. Temple location It is situated in Kanchipuram very near to Ekambareshwarar.